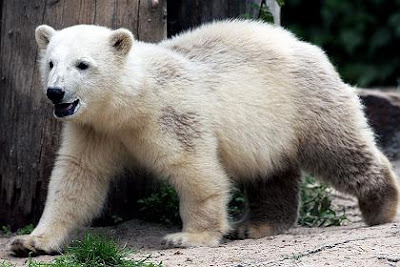 Knut, Berlin Zoo's celebrity polar bear cub, is growing from a cuddly ball of fur into a shaggy, powerful predator who could soon pose a serious threat to his devoted human keeper who has nursed him from birth. The cub, which still draws some 5,000 fans every day, turns six months on Tuesday and his 28 kg (62 pounds) are starting to show. His snout is longer, his torso chunkier and teeth sharper. ...In addition to porridge, the young star now tucks into fish, meat and cat food and is putting on around 200 grams a day. Last week, he learned how to swim and Doerflein takes Knut for a walk round the Zoo every morning to build up his muscles. His coat is no longer white and fluffy, but yellow and shaggy. "He is getting bigger and is gruffer than he used to be and is learning his role as a loner," said zoo vet Andre Schuele, who estimates that Knut will not be fully grown for another four years or so. ...Doerflein thinks he will be able to play with Knut until he is about a year-old, by which time the cub will be 60-80 kg, compared to about 500 kg when he is fully grown. The keepers say the cub regards Doerflein as his mother and is therefore unlikely to attack him, but some experts fear he could get dangerous sooner and point to worrying precedents. But the Zoo realizes the Knut show will not go on forever. "Knut is getting too big for this and we will probably bring the shows to an end in two or three months," said Raimund Opitz, who gives visitors a running commentary. The Zoo will consider moving Knut elsewhere after he is a year old. Several other zoos are keen to take on Knut to breed. Blow yourself up for Mickey!